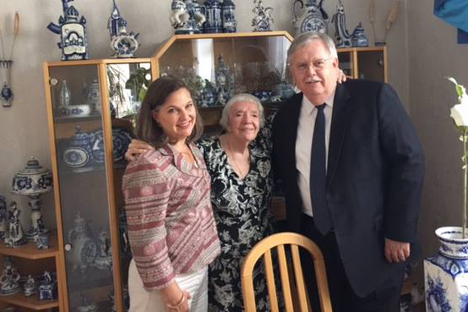 The meeting between U.S. Assistant Secretary of State Victoria Nuland and Lyudmila Alekseyeva, Russia's oldest human rights activist and the head of the Moscow Helsinki Group, addressed the situation of Russian human rights organizations and the situation of Ukrainian pilot Nadia Savchenko. "Victoria Nuland asked about Savchenko and asked me if I think Savchenko will walk free. I said I don't see any indications now," Alekseyeva told Interfax after meeting with Nuland. Nuland visited Alekseyeva in her residence in Moscow's Arbat Street. According to Alekseyeva, Nuland intends to raise the issue of Savchenko and the situation of Russian NGOs in dialogue with the Russian authorities. "I did not get the impression that the meeting addressed any special issues. It addressed issues relating to the human rights society. They are also very concerned about the anti-American propaganda. I said we are very concerned about the law on foreign agents, which sharply reduced the effectiveness of the human rights community," Alekseyeva said. "Victoria Nuland said she will raise the issue of the fact the authorities in some localities are trying more than enough on some human rights organizations and declare as foreign agents those who have not received any foreign money or engaged in politics," Alekseyeva said. Alekseyeva said the meeting was also attended by U.S. Ambassador to Russia John Tefft. Ukrainian pilot Nadia Savchenko is currently in a detention facility in Moscow. She is under arrest on the charges of complicity in the killing of Russian journalists in eastern Ukraine. The law on NGOs requires human rights organizations that are in receipt of foreign grants to bet registered as foreign agents. The Justice Ministry has now registered over fifty organizations, including the Memorial center, the movement For Human Rights and the Sakharov Museum and Public Center as foreign agents.